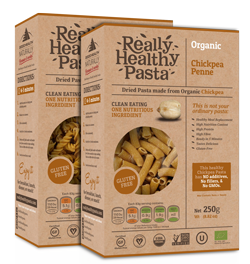 Really Healthy™ Pasta is a delicious gluten-free alternative to traditional wheat pasta. 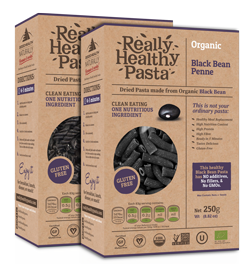 Made from legumes and healthy ingredient such as black beans, chickpeas, red lentils, and buckwheat and flaxseed… Really Healthy™ Pasta is a tasty way to have your pasta and eat it. Makes for a healthy meal replacement for people who live busy lifestyles and struggle to find healthy foods to eat. Really Healthy™ Pasta is high in fiber and protein, super easy to prepare and ready in 5 minutes, meaning it’s healthy food for on the go. 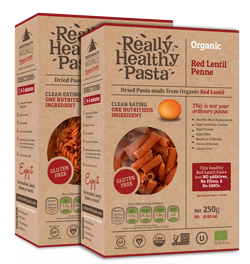 This super healthy and super delicious pasta contains only a single ingredient — red lentil — so that it is free from the fillers and additives found in so many processed foods. One cup of single-ingredient Really Healthy™ Red Lentil Pasta is equal to 1 cup of vegetables, making it almost effortless to get kids to eat their 5-a-day. What makes Really Healthy™ Mung Bean Pasta so special is how it is made. 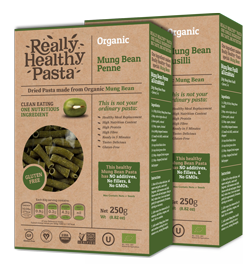 This super healthy and super delicious pasta contains only a single ingredient — mung bean — so that it is free from the fillers and additives found in so many processed foods. One cup of single-ingredient Really Healthy™ Mung Bean Pasta is equal to 1 cup of vegetables, making it almost effortless to get kids to eat their 5-a-day. What makes Really Healthy™ Buckwheat with Golden Flax Seeds Pasta so special is how it is made. 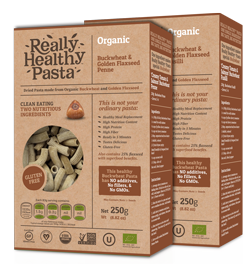 This super healthy and super delicious pasta contains only a single ingredient — buckwheat — so that it is free from the fillers and additives found in so many processed foods. One cup of single-ingredient Really Healthy™ Buckwheat Pasta is equal to 1 cup of vegetables, making it almost effortless to get kids to eat their 5-a-day.